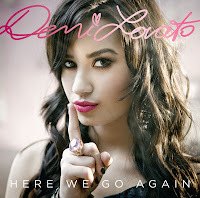 Today marks the release of Demi Lovato's album Here We Go Again! The sophomore effort from the teen sensation features new, very personal songs that were written with a goal to "inspire people, to help them get through whatever they're going through in their lives." Demi continues, "That's the ultimate goal with every piece of music I make." On her 2008 debut album Don't Forget, Demi collaborated with long-time friends and tour mates the Jonas Brothers, while Here We Go Again finds her branching out as a writer with such bold-faced names as John Mayer, "Torn" songwriter Anne Preven and singer-songwriter Jon McLaughlin. She also wrote again with Nick Jonas on the soulful, searching "Stop The World." Head over to Amazon today to buy the album and check out the remaining dates of Demi's headlining tour.